The battle for your streaming music budget is on, big time. Earlier today Europe-based service Spotify announced they’ve hit the 1,000,000 paid subscriber milestone – a full quarter million more than Rhapsody can count, and Spotify hasn’t even launched in the US. Apple’s fabled North Carolina data center still lies in wait for whatever it is the iPod maker may or may not be planning in the way of subscription-based iTunes. Zune still offers a great download/streaming hybrid value model, even if one Zune phone (Kin) has come and gone while the second one (WinPhone 7) is struggling to gain widespread adoption. And that’s not even mentioning Slacker Radio, Pandora, or any of the myriad other similar services out there. Now comes a pair of subscription music service announcements on the eve of SXSW in Austin, TX next week. First, Rdio has launched a desktop app for Mac. I’m actually using it to listen to Florence + The Machine right now as part of the free seven day trial the company offers. Florence is better than I thought she’d be, given I’d only heard the hype and caught a quick glimpse of her on Gossip Girl awhile back. Anyway, Rdio now offers two unlimited music plans: Rdio Unlimited (web, MAC/PC desktop, mobile, Roku, Sonos) for $9.99/month and Rdio Web (Web interface only) for $4.99/month. The desktop app includes tricks like searching your iTunes library to pre-populate your Rdio account with music you’ll hopefully like, browser-free listening to Rdio tracks, and playback control via your keyboard’s media buttons. accessible via the Web and mobile apps.The good news is that the presser will be webcast so folks like me who aren’t going to Austin can still find out what MOG’s up to. 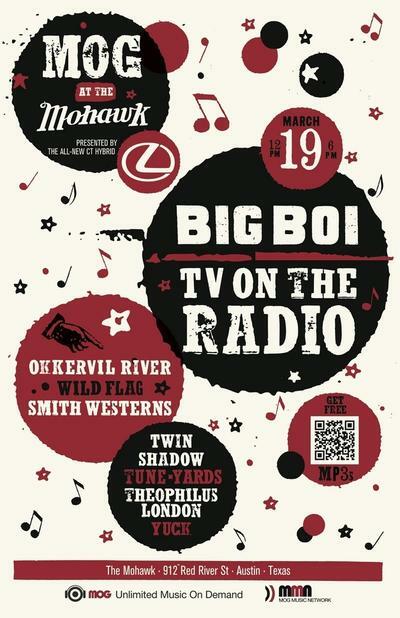 The bad news is that folks like me not going to Texas will miss the afterparty’s awesome double headliner of Big Boi and TV on the Radio. If you follow me on Twitter, you know what a TVOTR fanboy I am, and while I’ll admit to not having followed Big Boi’s recent solo efforts, I’m a big Outkast fan from back in the day. TVOTR’s new album, Nine Types of Light, drops April 12, by the way. MOG has also recently announced deals to bring their service to LG internet-capable TVs and the Sonos music system platform. The Berkeley, CA companies is also said to be in talks to bring their service to other connected TV platforms including those from Samsung and Vizio. Would you give up true ownership of your music if you could listen to anything you wanted at any time for ten bucks or less per month? What about if you could listen to almost anything almost anywhere? Sound off on subscription-based streaming in the comments!